In order to be in full compliance with FTC rules regarding fair business practices I am making the following affiliate marketing disclosure. 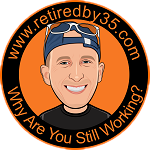 The content published on www.retiredby35.com may occasionally contain affiliate marketing links. I may earn an affiliate commission in case you make a purchase. However, I am only recommending products and services that I use myself, believe in, and that I think offer the reader additional value. It is impractical to highlight every affiliate agreement I have. As such, it is best to assume that any links on this website and blog that are leading you to products or services are affiliate links and that I might receive a small commission, should you buy from this vendor. If you have any questions regarding the above or about specific affiliate marketing links, please do not hesitate to contact me by using the messaging window or the contact form.